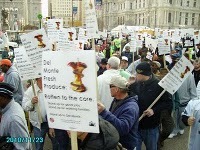 Urgent Call: Stop Del Monte from taking our Jobs! The members of our Local have served the Port of Philadelphia proudly and professionally for decades. We strive for excellence and safety as we labor in one of the most dangerous occupations in our nation. Our dedicated labor deserves to be treated with respect and economic justice, but on Oct. 1, 2010 Del Monte Fresh Produce Co. did the opposite by moving its fruit ships away from an ILA-worked Pier 5 facility in Camden, New Jersey and taking them to the Holt family privately owned Gloucester Terminal. This move means that more than 200 full-time ILA jobs, or 400,000 labor hours will be lost to the ILA, representing about one-third of the union’s hours annually on the Delaware River. This callous action is devastating families and local businesses that benefit from these jobs in Pennsylvania, New Jersey and Delaware. To make it worse, Del Monte pays workers at the new facility $8.50 to $10.00 and hour—less than half of what ILA members earn. The move by Del Monte is made even more shameful in that the corporation did this after pressuring the ILA to give $5 million in wage and other labor concessions. And in an effort to keep the Del Monte jobs and business, the State of New Jersey made $25 million in infrastructure improvements; offered more acreage at no cost and a cap on electricity bills from $1.3 million to $700,000. This collusion by Del Monte with the Holt family to get more profit is more than disrespect—it is total disregard for families and local government! It is union busting! Your solidarity will make a difference.